In 1982, Geraldine McEwan put in a relentlessly ball busting performance as Mrs Proudie in the BBC’s The Barchester Chronicles, a perfectly cast adaptation of Trollope’s The Warden and Barchester Towers, in which even against the apoplectic indignation of Nigel Hawthorne’s Dr Grantly, she was the one who came across as the force of nature. In 1978, she played Miss Brodie in an ITV adaptation of this novel, giving a subtler performance, but still in many ways domineering. Watching the TV series in the wake of McEwan’s death last January, I felt as though it was setting me a puzzle. She was – as in the novel – a maverick primary teacher at Marcia Blaine school for girls in Edinburgh, in the early 1930s. A dull school in the main, she was its ‘leaven in the lump’, wilfully disregarding the expectations of Miss Mackay, the headmistress; in fact disregarding every reasonable expectation that a teacher should teach the subjects set. She would put a long division sum on the blackboard in case of intruders, and then hold forth about her holidays in Italy, or about ‘Il Duce’ (Mussolini, her hero). She held that culture, and particularly art, are paramount, and taught these to the complete exclusion of anything mathematical or scientific. She tried to encourage – no, demanded – a passion for the arts, weaving her own life story into her lessons (a love lost in the Great War), to show that life and art are inseparable. She wanted her pupils to build successful lives on this foundation, rather than on one of learned dates and times tables. I mean, that’s great, isn’t it? All apart from the bit about Mussolini. 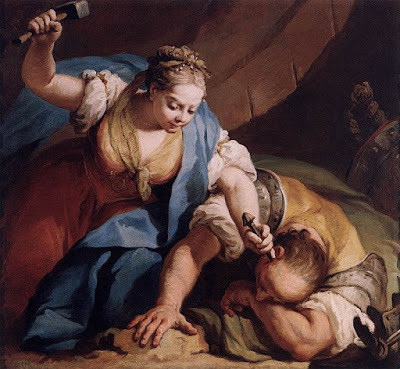 Jael & Sisera, who feature in a sub plot. There’s nothing quite like the winding down of a big Victorian novel: the hard part is done, for writer and reader, and all that remains is a series of farewells and tyings up of loose ends, maybe a sneaked glimpse into the future to make sure that the happy part of the ending really is happy. In a sense, The Last Chronicle of Barset is a victory marathon, recycling plots and characters from the five preceding novels, adding little; but that little is precious, because it’s the end. There are more simultaneous and more loosely connected plots here than previously (the Trollope Society site refers to the strands as ‘congeries’), but the main one concerns a stolen cheque for twenty pounds. Lord Lufton’s man of business, Mr Soames, last saw it at Mr Crawley’s house, and a few months later Mr Crawley, the impoverished perpetual curate of Hogglestock, had it cashed. ‘How Did He Get It?’ is the opening chapter’s title, and it’s six hundred odd pages before anything further is revealed on the subject. As a plot device, it’s a bit of a MacGuffin, lacking the pull of Mark Robarts’ spiralling debt in Framley Parsonage, partly because of its static nature. Robarts makes various bad choices in the former book, but Crawley is passive: misfortune falls upon him, first the accusation, then the progression from magistrate’s court to the prospect of a full trial at the next assizes, not to mention a clerical commission investigating his fitness to continue church duties, contrived by Mrs Proudie and ordered by her long-suffering husband the bishop. When he feels that the public believe in his innocence, he stands up to the misfortune, refusing to give up his parish while awaiting trial; but when they start to doubt it, and he starts to doubt it himself (not thinking he has deliberately stolen, but that he has inadvertently taken up the cheque), he relents, and almost relishes the act of giving up his parish unconditionally, before the trial can take place. This clash of father and son is strongly reminiscent of Lady Lufton’s opposition to her son’s marriage to Lucy Robarts in Framley Parsonage, and she does her best to soften his attitude because of her own experience. Another great clash is Mr Crawley vs. Mrs Proudie (who is forever Geraldine McEwan, even more than Archdeacon Grantly is Nigel Hawthorne); yet another is Mrs Proudie vs. Bishop Proudie, which has two surprising outcomes, the one I shall mention here being the bishop almost catatonic with depression after she too-obviously directs his official actions in front of outsiders, destroying his self-respect: ‘You have brought on me such disgrace that I cannot hold up my head. You have ruined me. I wish I were dead; and it is all through you that I am driven to wish it.’ (p. 577). He, like Lily Dale and Mr Crawley, finds his greatest strength is to refuse. Everywhere in this story are Bartlebys, declaring ‘I would prefer not to’. There are also a few instances of young men – John Eames and the artist Conway Dalrymple – getting dangerously close to committing themselves to young women (Miss Demolines and Mrs Dobbs Broughton respectively), before finally finding a way to say ‘I would prefer not to’. To a greater or lesser extent, the women are trying to entrap them. Eames here is no improvement on the Small House at Allington edition: he is just as besotted with Lily Dale and just as likely to flirt with other women to distract himself. Trollope attempts an intervention against this interpretation of his character, but he is ultimately trivial: ‘light of heart’, as Lily puts it. The London scenes generally do not match up to the Barsetshire ones, but the whole I found more satisfying than The Small House at Allington, and it brings everything nicely to a close. It was good, too, to say goodbye to Mr Harding, the sweetest of the Barsetshire characters, and an important presence here, in his declining years. He even coaxes from his creator a half-decent grand-daughter (children are not Trollope’s strong suit), Posy, with whom he plays cat’s cradle as long as his strength allows.